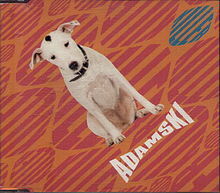 I remember being quite entranced by the otherworldly and quite surprising Adamski video for ‘Killer’ being piped out on Top of the Pops for the very first time as a kid in 1990, when it had just shot straight to number one. First there was Seal – a striking looking black man, statuesque, dreads and leathers and the possessor of a voice that was both soulful and quite uniquely powerful. In a mirror of the Pet Shop Boys set up, he’s backed by Adamski, a silent professor of acid house, concocting future sounds in a backwards cap. While the video was like some prototype Sci-fi, the free rotating heads, the spaceship backdrop, heart monitor machines, the digital effects on green screens, it was like looking at a ZX Spectrum game colliding with rave culture. Not to mention the soundtrack ‘Killer’ which is a stone cold pop classic, a shuddering dancefloor beat with synths and inventive laser sample breaks that sound like they have beamed down from the Star Trek Enterprise. While Seal delivers a vocal that’s part unifying force part dystopic cry: it’s still his finest moment as a vocalist.